Make sure your windows will supply you with your desired level of comfort throughout the changing seasons. Suburban offers different frame and glass options to fit your comfort and cost requirements. Be sure you are also comfortable with the company and representative you're doing business with. Suburban offers a comprehensive catalog of window styles, glass, and color options to fit most any customer request. If you're building a new home, your contractor can frame your home to fit the size of windows he or she happens to have available. When it comes to replacing your home's current windows, your contractor needs to consider expansion, contraction, settling and more - often creating different sized openings. Each opening needs to be measured with precision and your windows ordered to those sizes, in order to ensure proper fit and performance. 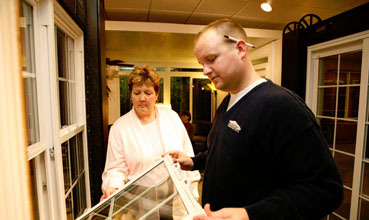 At Suburban, all your windows will be custom made, often at a better price than many company's "standard size" windows. With over 20,000 jobs completed to date, Suburban's enormous window volume gives us great buying power with our manufactures. That is how we can offer you great windows at a great price. Manufactured to the highest standards, Suburban's windows carry the Energy Star label, certifications from the NFRC, and more. Additionally, we are a licensed, bonded and insured agent. You want a fair price. Don't be misled by others offering replacement windows for a cheap price. Often times, this is a low-end window you might use for a garage, not your home. Usually, this cheap price doesn't include measuring charges, custom sizing, replacing rotten wood, insulating inside weight cavities and around perimeters, or covering the outside window trim with maintenance-free aluminum and sealant. At Suburban, you always get a complete installation without any hidden costs. Honest. Please enter the number 44753 in the box provided below.